It seems that no trip to France is complete without a requisite castle visit. During our vacation in Normandy, we weren’t exactly seeking them out, having already overdosed the year before in the Loire Valley. Still, we couldn’t escape at least one, and that one ended up being Domaine de Villarceaux. The choice was quite random (I think we might have spotted it in a brochure), but it led us to a hidden treasure. 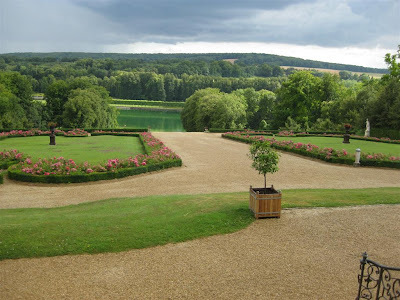 Domaine de Villarceaux is different from any other castle I’ve been to in France. First off, there are no hordes of tourists, probably because it only opened to the public fairly recently and it is almost impossible to find. 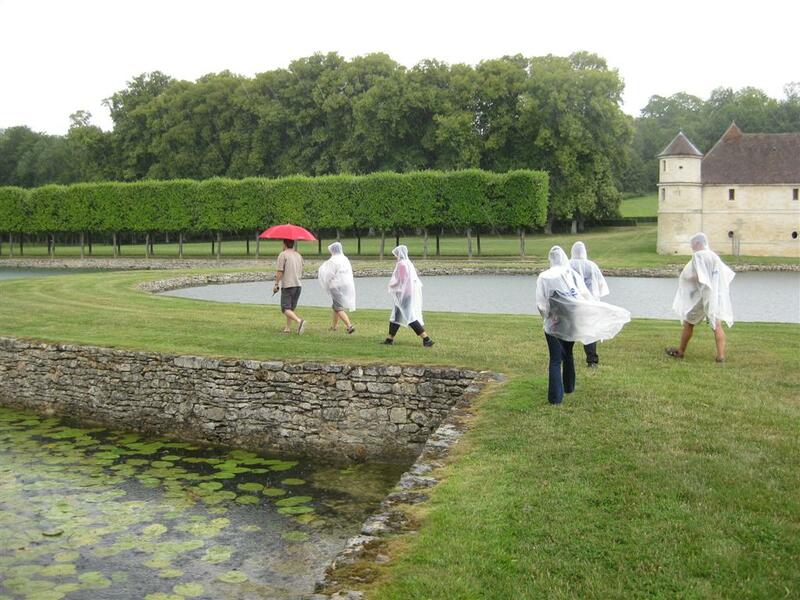 Second, this particular chateau can only be visited by guided tour. With only 6 people on our tour, including our own group of 4, it was a treat to have a personal, expert tour leader. And third, the whole thing, including the guided tour, was free! This must be unique in all of France. 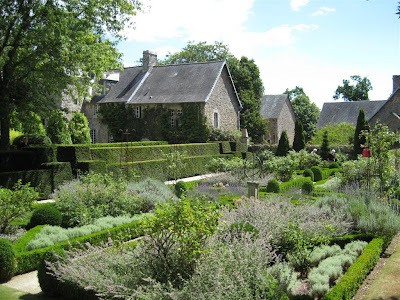 The highlight of Domaine de Villarceaux is definitely the gardens. The chateau itself is quite small, and not as impressive as some others in the area, though still certainly worth a visit. 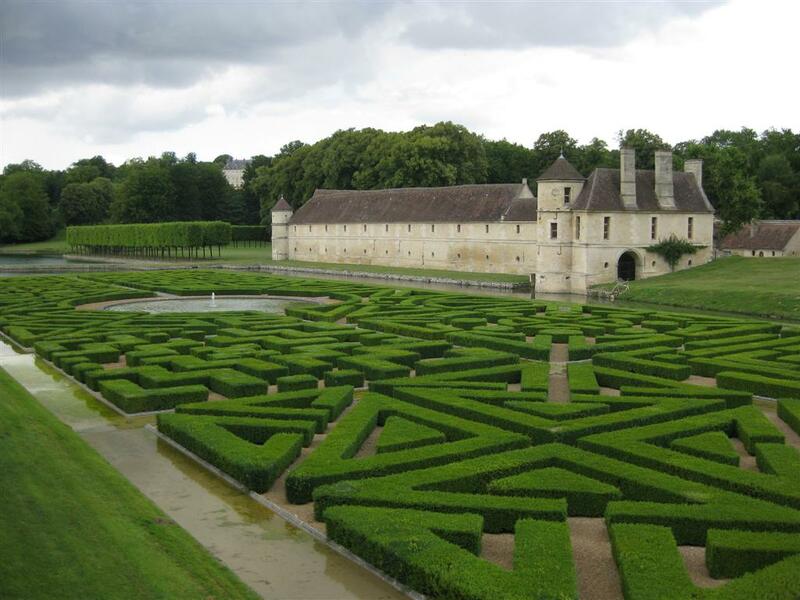 However, the gardens, which sweep from the castle down a hill and into a broad valley, are enough to fall in love with. 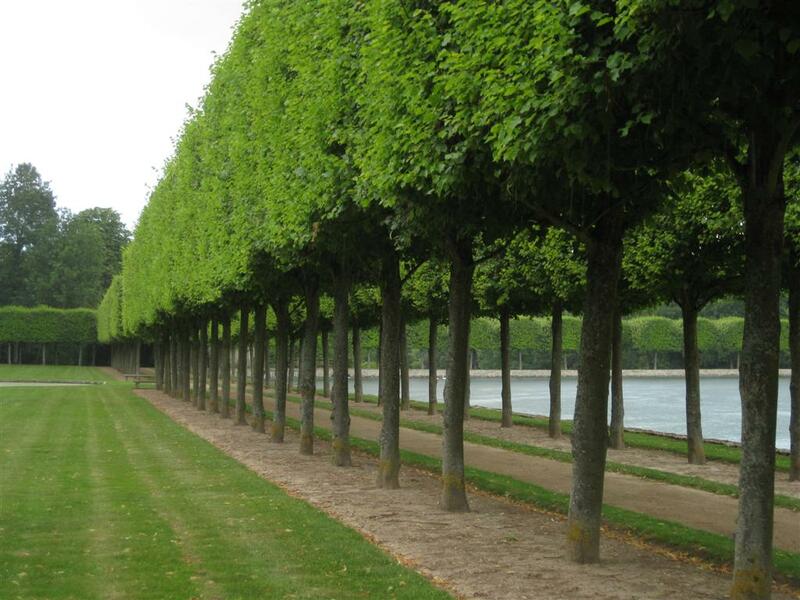 The building blocks of the garden are classical and minimalist: lawn, hedges and water. What makes them remarkable is the way all the elements sit so well in the landscape, how they fill the space, and how easily they flow into one another. The entrance to the chateau is on the far side of the property, by the stables and other utilitarian buildings which are quite beautiful in their own right. The tour of the gardens proper starts up a few worn steps to a small stone tower, which was built especially to hide and protect the property’s spring, apparently a very valuable commodity in former times. Surrounding the tower is an enforcement wall and a surprising, elevated herb garden. Hidden by walls on all sides, and with no seeming connection to the ground, this garden felt a bit like a secret sorcerer’s laboratory. Descending from the magical herb garden, you are met by the best view at Villarceaux: a floating garden backed by a long view of the valley. 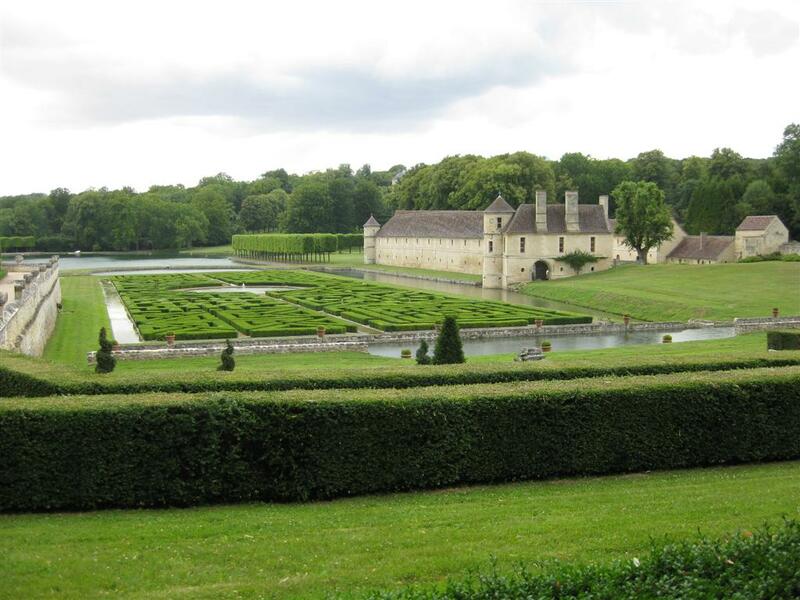 The floating garden is in fact an intricate hedge parterre, surrounded and transected by still, dark water on all sides. It’s the first time I’ve seen this and the effect was unmistakably ‘floating’ and very striking. The gardens then proceed to snake their way through the valley, with a large grass bridge between two bodies of water leading up to the castle. On our visit, it started to rain at this point and the very friendly staff came running down with rain jackets for everyone (yet another unique feature at Villarceaux)! The castle itself doesn’t make an appearance until the very end of the visit, after a fairly long climb up a grassy slope. The slope is intentionally designed to be nearly invisible from the castle thanks to clever land-shaping. This was done in order to make the outer landscape, including the lake at the bottom of the valley, appear much closer, right outside the castle doors. Only those who venture outside to explore the grounds are surprised by the long stroll down and the many secrets of the gardens below. One last neat thing about Domaine de Villarceaux is their environmental conscience. The gardens are managed completely organically, and plans are underway to construct a tiny hydro plant in one of the ponds to supply power for the fountains and garden lighting. 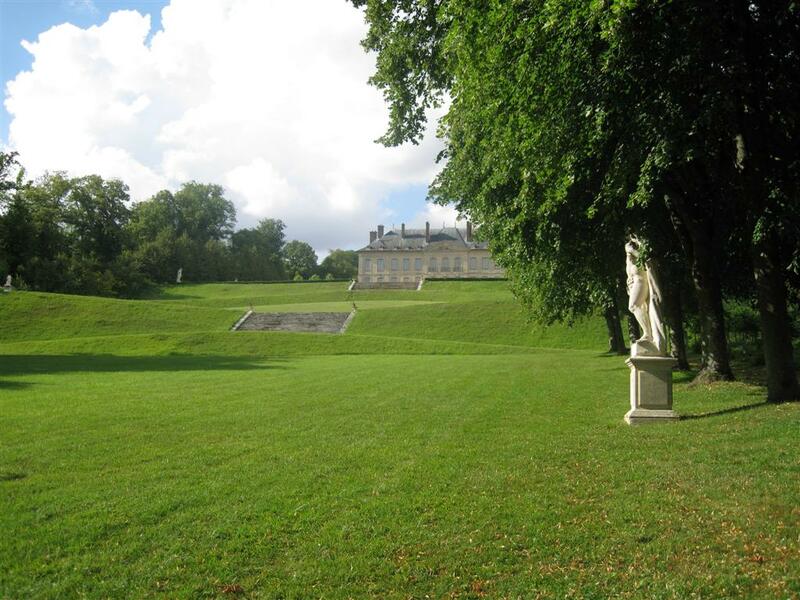 Les jardins d'Argences are residential gardens created around a beautiful stone mansion in Normandy. The house is stunning and the surrounding countryside even more so. But unfortunately, my honest impression of the garden was that, while nice enough, it was missing that special something. Everything is very pleasant and comfortable, but there are no moments when you feel captured by this garden. It’s the type of place you could easily relax in with a nice book and a glass of wine, but you’d be admiring the house and the tranquil French countryside first and foremost. And that doesn't sound too bad, except that in this case there are in fact gardens which occupy the space between house and countryside and that's what we went to visit. Before I launch into this one, I just want to issue one warning: this garden is extremely photogenic. I look back at the pictures and I almost don’t recognize the place. It’s another example of how the camera can, and often does, lie. By always trying to take good pictures and choosing angles, we didn't capture the place honestly. You’ll have to trust me that something was missing in this garden though, because the pictures sure don’t give it away. The owner’s first gardening attempts resulted in little skinny borders, which she was painfully dissatisfied with. That was all the motivation she needed to launch into the project full force , ending up with 9 different gardens scattered around the house at present. The best parts are actually the oldest, which perhaps don't try to do too much and work off the house, using its French charms to full advantage. The courtyard in the middle of the U-shaped main buildings is the best example. 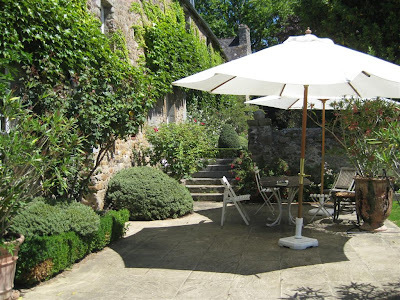 You don’t need much when you already have such a perfect setting – a few plants crawling up the stone house, some old shade trees and a generous patio of local stone (which is where I would sit with that book and drink) are more than enough. From here, you go on to various small garden spaces surrounding the house. The first two are formal in nature, with a rectangular, shallow pond in the first, and a large parterre in the second. The garden in the back of the house features more informal, English-style borders of perennials and a circular pond one one side of the central lawn. The pond is a perfect example which I think shows how the camera can distort one's perception. In the first photo, the angle makes the lawn look nicely anchored in the garden, a perfect garden picture. But from another angle, you can see that in reality it's floating on one side of the lawn, and meets up awkwardly with the straight-edged flower border. To travel on, you follow a small stream in a little valley around the side of the house. This offers a very pleasant respite from the open areas, complete with lush stream-side plantings. More gardens await at the end of the stream, including some with a more formal layout as well as a more casual garden composed mainly of lawn, with a few, not particularly happy-looking, perennials and a naturalistic pond in the middle. And there’s also the requisite labyrinth. So, why didn’t I like the gardens? 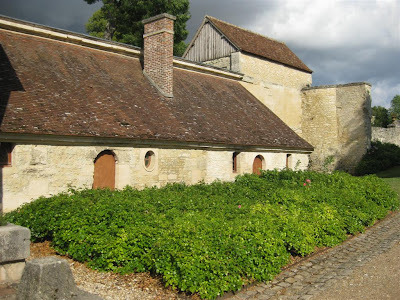 In my opinion, the incredible potential of a beautiful French house and property were wasted. 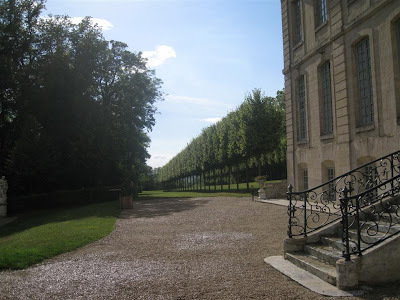 I had the feeling that I was walking through a series of gardens I had seen in different books, placed here on the whim of the garden maker, but with no connection to each other. This is a beautiful spot that demands its own treatment, not just a collection of gardens to show off different styles. I thought the saddest example of a missed opportunity, of not looking at what is there, was the moat. Yes, the house had a moat on three sides; a centuries-old one with mossy stone and actual water flowing through it. And yet, it’s not in any of the pictures because the gardens completely ignore it, and in fact obscure it most of the time. And then there were the details. I often forget how important they can be, but this garden was a good reminder. There were many little things that just felt a little off, enough to change your whole perception. In some cases the proportions didn't feel quite right, or there were walkways that didn’t connect or weren’t wide enough, or patches of glaringly bare soil between plants. These are the kind of things that don’t show up on camera, but play a huge role in shaping your impressions when you're there.